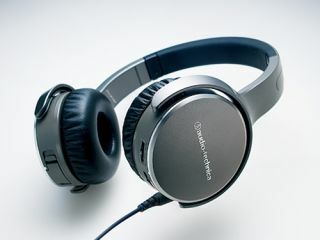 Audio-Technica unveils new headphones range, first gaming headsets | What Hi-Fi? New on-ear headphones for use with smartphones and tablets among a raft of new headphones unveiled by Audio-Technica at CES 2014. The SonicFuel ATH-OX5 and ATH-OX7AMP on-ear headphones for use with smartphones and tablets were among a raft of new headphones unveiled by Audio-Technica at CES 2014. A new range of SonicFuel CHX buds and SonicFuel AX headphones were also launched by Audio-Technica at CES, along with the company's first ever gaming headsets. Both the SonicFuel ATH-OX5 and ATH-OX7AMP are designed for audiophiles looking to get the best possible sound from their portable devices. Features include a detachable cable with volume and track control, built-in microphone, an extra cable and carry pouch. Both models are expected to be available to buy from spring 2014. The SonicFuel ATH-OX7AMP (£200), which offers a 9-26,000Hz frequency response and a built-in battery powered amplifier, boosts the volume output level from smartphones and tablets. Meanwhile, the ATH-OX5 (£130) comes without the amplifier, provides a 15-22,000Hz frequency response and a 40mm driver unit designed to handle more demanding rock and pop music. Audio-Technica's new SonicFuel CHX range comes with a revolutionary ear-tip that fuses in-ear headphones with more traditional earbud style headphones to create a new hybrid product. The ATH-CHX7iS (£45) and ATH-CHX5iS (£30) offer full sound with deep bass, but let you hear what's going around you when out and about while also keeping your music private. In-line controls for calls and music functions can be found on each of the tangle-free flat cables, which Audio-Technica says makes the SonicFuel CHX range ideal for music fans on the go. A new range of SonicFuel AX over-ear headphones mark an expansion of SonicFuel's collection of CKX Series in-ear headphones and are fully compatible with the latest smartphones. The new range comprises the ATH-AX5iS (£65), ATH-AX3iS (£45) and ATH-AX1iS (£30), with all models coming with a built-in microphone and cord-mounted remote. All three models feature swivelling earcups for a comfortable over-ear fit, with the ATH-AX5iS and ATH-AX3iS also offering a padded headband for additional comfort. Audio-Technica also confirmed it will be expanding its SonicSport fitness-orientated range with the launch of its ATH-CKP200iS (RRP £35) ear hook style headphones. A cord-mounted remote lets you control volume and music playback functions on the fly, as well as providing easy access to controls on a range of compatible portable devices. Elsewhere, Audio-Technica entered the world of gaming with its first ever gaming headsets – the closed-back ATH-AG1 and open-back ATH-ADG1 models. The design and engineering of the two models are directly influenced by Audio-Technica's A700 and AD700 Series, with both featuring large 53mm drivers and bobbin-wound CCAW voice coils. Audio-Technica says the ATH-AG1 and ATH-ADG1 will be available in spring this year for £240 and £265 respectively.